Hi everyone, it's Cheetarah here and this month the StencilGirl® Creative Team shows how we store things in our studio. I'm fortunate enough to have an apartment where we both have our separate offices / creative space and I just love spending time in my little home studio. This is my art desk where all the art stuff happens :) I have a LOT of stuff stored here that I need in reach, like brushes, markers, glue, my art journals, ink, watercolors etc. 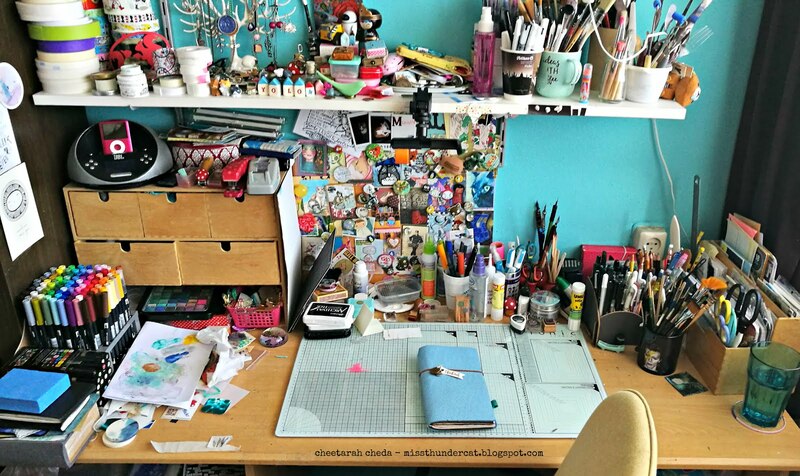 but I am good at keeping my work surface clean after a project, thankfully. 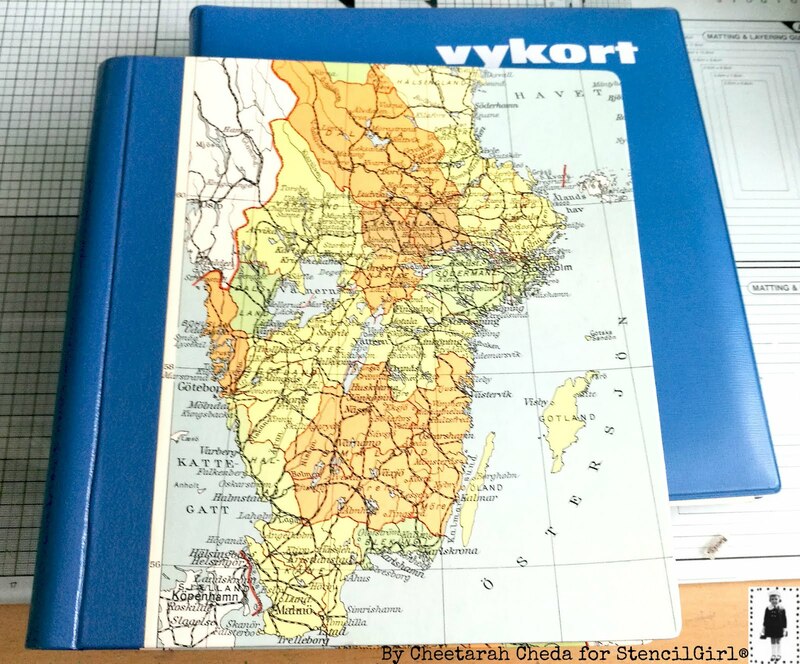 That is the traveler's notebook I currently am working in. Let me give you a little tour of the room. 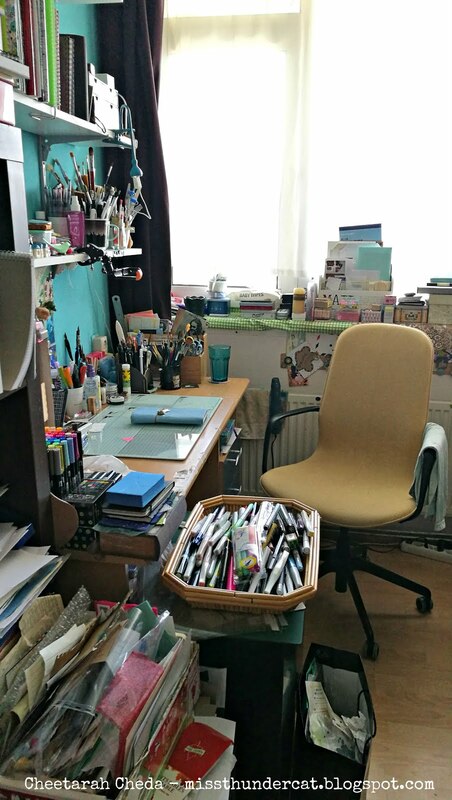 This is what it looks like when you come in, on the left side my art desk with boxes of papers and trays of markers & cups of brushes and yes I store stuff on my windowsill as well, things I want near but have no room for on my desk. 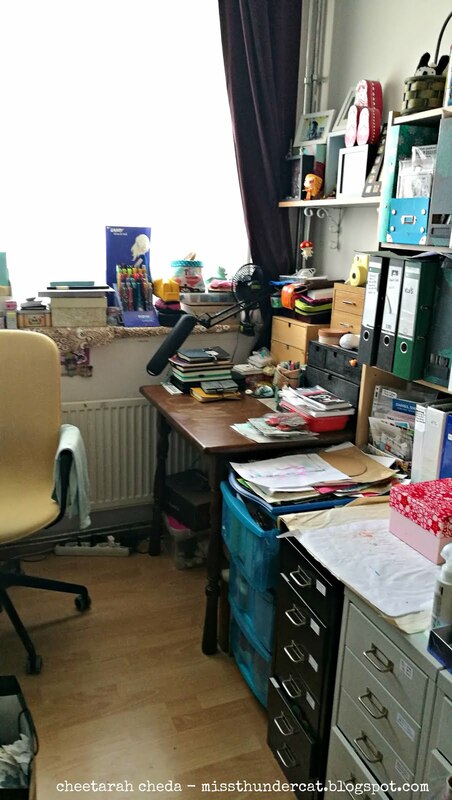 On the other side is my writing desk. You can see the stack of planners I use for my writings and my Lamy fountain pen collection display box on the window sill. Here I do stuff that is writing related but as you can see, there is a lack of computer here which I like because I don't want to get distracted by the internet in this room! I also try to leave my phone out but it's difficult as it's also my camera, haha! 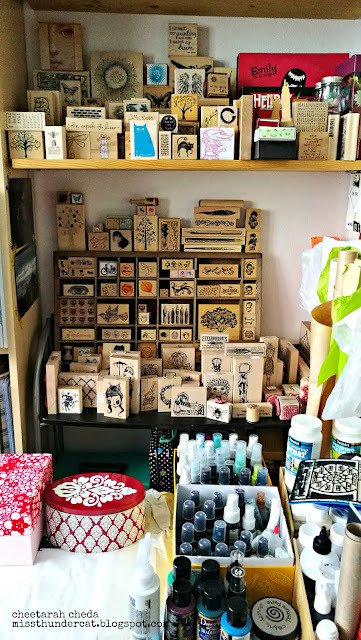 When you turn to face the wall on the right side you'll see my rubber stamp storage - wood mounted stamps that is. The cling & clear stamps are in ring binders. Sprays are stored in open boxes next to the "spray work surface" on the smaller cabinets that created an impromptu work surface. 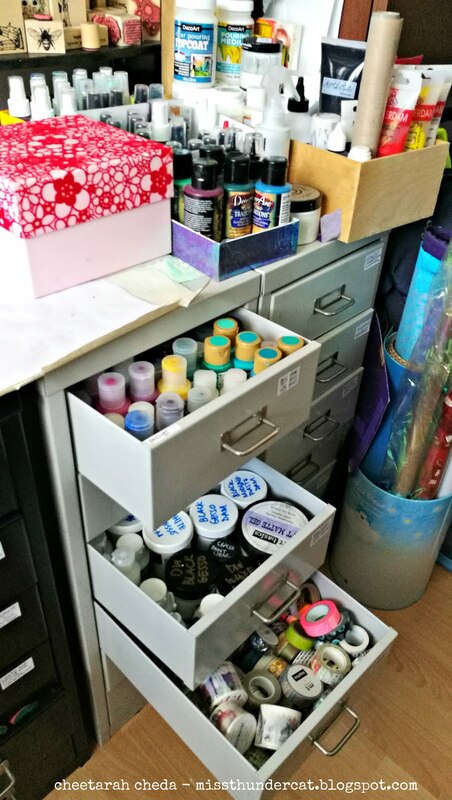 In the cabinet drawers (which were donated to me by very good friends who moved away) I have paints, mediums, masking tapes, pigment powders, pastels, etc... all drawers are labeled and the cabinet closest to my desk has all the ink pads and markers (yes more...) and watercolor paints. And one last thing I wanted to show you in my studio is the shelf where I store my little collection of figurines/vinyl toys of Cheetara's of the Thundercats :) The one from the far right is an original one from the 1980's. I also collect prints of her and have quite a few. "Stored in my studio" is of course also about how you store your stencils. So this got me thinking on how to effectively store my stencils because I want a fast visual reference. The storage solution I had was not sufficient for this and I kept forgetting which stencils I have. 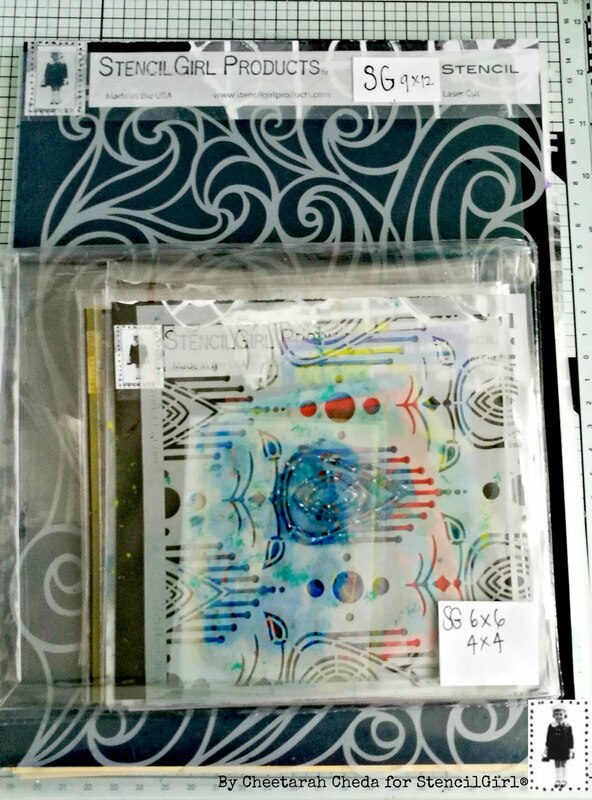 I stored them in see-through file folder & have an excel file with the stencils I own. This is fine in itself but the visual reference, locally in my studio, was lacking. As I told you earlier, I rather do not want to look up stuff on the internet while I am working. So I set out to make a visual storage with the help of a vintage postcard storage idea. 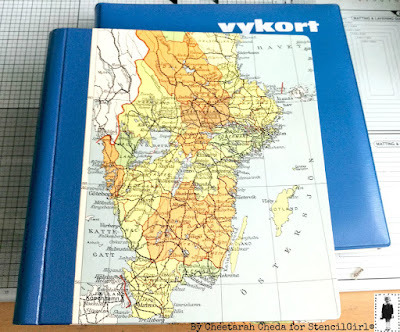 I have bought these vintage postcard binders at a thrift store on vacation in Sweden and just LOVE how these albums look. They have paper sheets inside them and I figured I could store the stencils in them instead of the postcards that were currently still there. 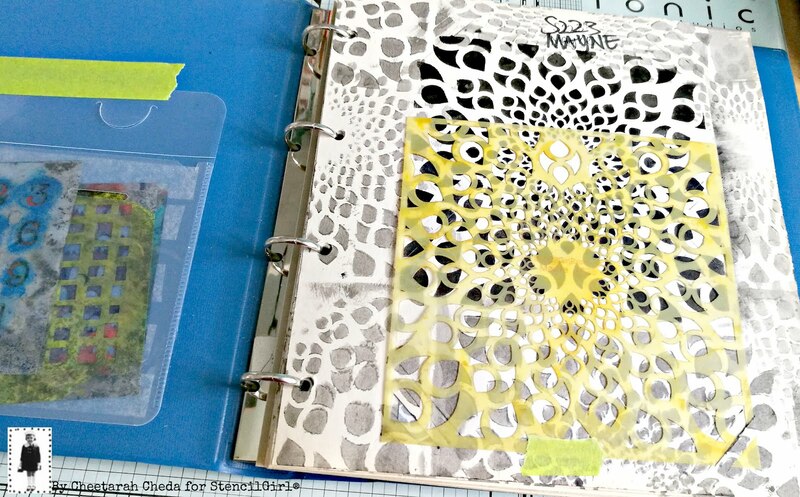 I stenciled on the paper sheets (and also made reverse prints of them in some cases) with black acrylic paint to create my visual reference album and stored the coordinating stencil on the sheet. Of some, I kept the packaging of so it would not tangle with the stencil on the opposite page. 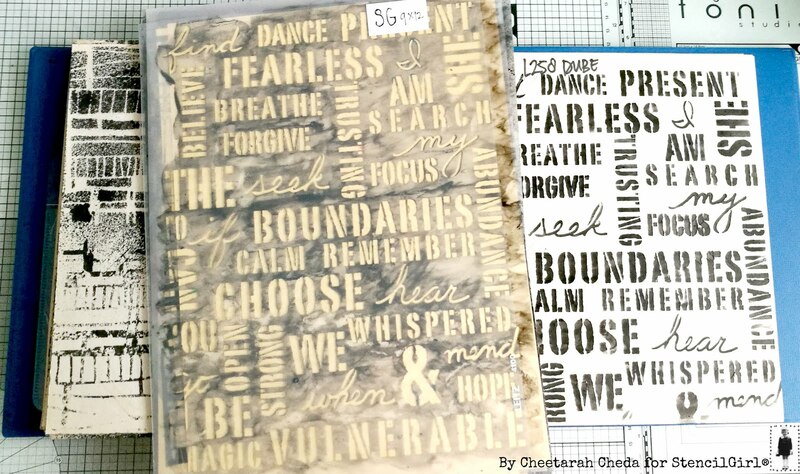 All the small and mini stencils I currently own are now stored in the binder. 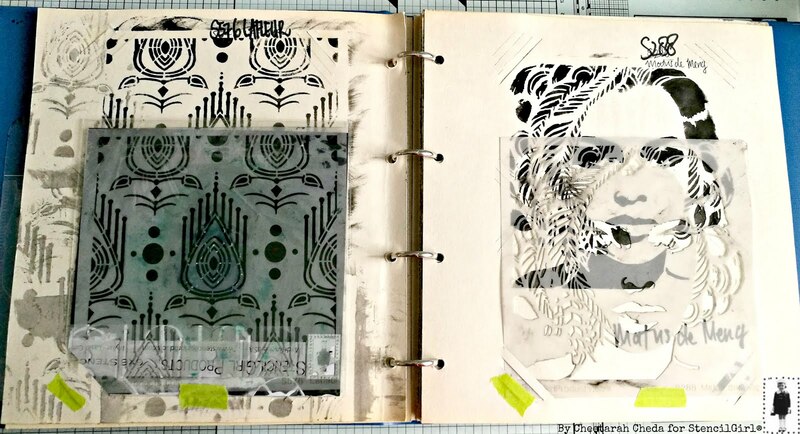 The large stencils I did stencil out & printed in the visual reference book, but kept them in the large file folder still. 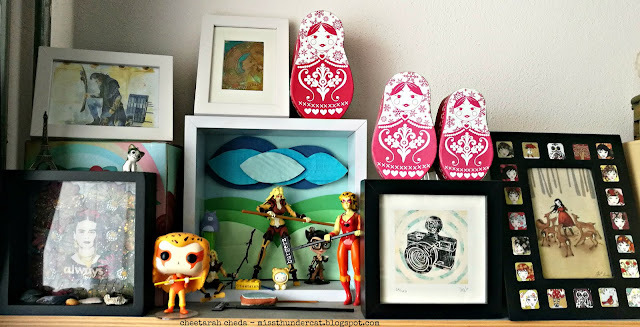 What a great idea and just looking at them with a print can inspire you. love this! I love how well this works!